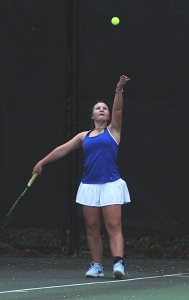 The Chamblee Lady Bulldogs swept by Bainbridge 3-0 in three straight-set matches to reach the Class 5A girls’ state tennis Final Four on Tuesday at Chamblee High. Sophomore Madison Trinh (8-1) bounced back from her first No. 1 singles loss of the season against Carrollton to win 6-1, 6-2 to get thing going for the Lady Bulldogs who improved to 20-0 on the season. Junior Grace Pietkiewicz (13-1) matched Trinh with a quick 6-1, 6-0 victory of her own to give Chamblee a 2-0 advantage. Senior Olena Bilukha and sophomore Madeline Meer improved to 9-0 on the season as a duo with a straight set 6-3, 6-4 win at No. 1 doubles to clinch the 3-0 victory for Chamblee. Chamblee had beat Bainbridge 3-0 in the Sweet 16 round a year ago. The Lady Bulldogs move into the Final Four for the second consecutive season and will host the Buford Lady Wolvers (15-6) who defeated South Effingham 3-1 to advance to the Final Four. The Bulldogs did not far as well as a fine 15-5 season ended in the Elite Eight with a hard fought 4-1 loss to McIntosh who eliminated the Bulldogs 4-1 in the Sweet 16 a year ago. Jake Busch and Eshaan Agrawal were the lone winners for Chamblee as they took the No. 2 doubles match 6-3, 6-2. Sam Lehmann battled back from a 5-7 loss in the opening set to win 7-5 and send the match into a tiebreaker. Lehmann dropped a tough 10-6 decision. Dixon Hall and Carter Difonzo won their opening set 6-4 at No. 1 doubles, but dropped the next two sets 2-6, 3-6. Allen Howell fell 1-6,1-6 at No. 1 singles and Chase Starks dropped a 1-6,3-6 decision at No. 2 doubles. The Tucker Lady Tigers suffered just their second loss of the season as they fell to John’s Creek 3-1 in the Class 6A quarterfinals to end an exciting Tucker tennis season. John’s Creek’s Shelly Ray opened the scoring as she outdueled Tucker’s Daelyn Turner 6-3,6-1 in what was a close match. Five of the seven games in the second set went to deuce. Summer Clemons evened the match with a 6-2, 6-2 victory over Amie Wang to win No. 3 singles. John’s Creek went up 2-1 as Sophia Ahn and Madison Neathery won 6-1, 6-3 over Tucker’s Kelsey Hayes and Sarah Penkava. The match was clinched as Carson Tanguilig upended Tucker’s Autumn Clemons 6-4, 6-1 at No. 1 singles. The Dunwoody Wildcats joined Chamblee in the Final Four round as they traveled to Glynn Academy and came away victorious at 3-0 over the Terrors. Dunwoody heads to Region 7-6A foe Northview which defeated Coffee 4-0. Dunwoody is the Region 7-6A No. 3 seed while Northview was the No. 2 seed heading into the state playoffs. Dunwoody is in the Final Four for the second time in three seasons (2016, 2018) after missing out on the playoffs a year ago.